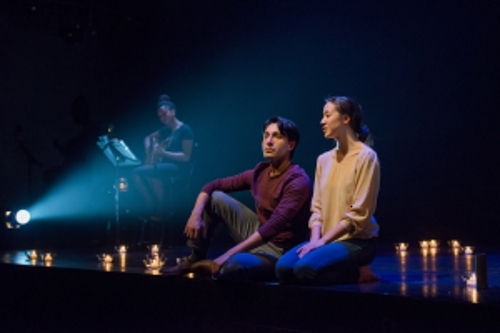 “Reimagined” for a modern day audience, director Ravi Jain’s creative reworking of David French’s classic Newfoundland romantic comedy, Salt-Water Moon (now playing at Factory Theatre), is both winsomely endearing and utterly swoon-worthy. I can always appreciate a romantic comedy if done well, and fortunately Jain knows exactly how to set the mood. As soon as we stepped into the theatre, we were greeted by the sultry sight of a warmly-lit stage, strewn with a constellation of candles that Mary Snow, played by Mayko Nguyen, lights one-by-one before she is interrupted by the surprise return of her old flame (pun intended), Jacob Mercer (Kawa Ada). As much as Salt-Water Moon is about Mary and Jacob’s courtship, it also contains a deeper message on the power of stories. While Jacob’s homecoming is by no means a smooth one, having left Mary for a job in Toronto without saying goodbye, the couple is ultimately able to rekindle their connection and even further their understanding of one another through the recounting of childhood memories and commiseration over present struggles. The importance of the storyteller is also emphasized by the inspired choice to include Ania Soul on stage as both musician and narrator. French’s stage directions were read aloud by Soul rather than shown and, with only an oral description of costumes and props, Jain invites us to consider the possibilities and limits of storytelling. How much can our imagination fill in? What is the real story: the one we see on stage or the one told by Soul and French? We couldn’t keep our eyes off Nguyen’s spectacular performance as the indignant-but-always-dignified Mary. Under Nguyen’s nuanced rendering, Mary is an empathetic, complex character searching for agency in an unforgiving social class. Ada was a bit stiff at the beginning but later relaxed into an easy and irresistible charm as the prodigal Jacob Mercer. Nguyen and Ada’s chemistry was so off-the-charts that my companion was on his feet as soon as the lights fell on the last impassioned exchange. However, one thing that bothered us was that, while Salt-Water Moon is written in dialect, the performers were not on accent. Although I understood the rationale behind this choice, I thought some of the rhythm of the phrasing was lost and, consequently, made the dialogue harder to understand. There were also times when the actors spoke so quickly and quietly that we couldn’t decipher any of their lines. Moreover, while Jain is a master of the perfectly arranged stage picture, I can’t help but wish there was more movement on stage. Perhaps it speaks to the chemistry of the actors, but sometimes I just wanted to yell at them to get closer. As compelling as the performances were, I would’ve liked to see as much energy and expression in the dramatic monologues as there were in the more comedic moments. In his director’s note, Jain writes that “many different cultures used song to tell story, they were a way to keep the story alive in the hearts of the people.” After seeing Salt-Water Moon, I would suggest that there was another method to ensure the relevancy of older stories: by giving new storytellers the opportunity to tell them. As an Asian Canadian woman, not only did I see the stories of the Mercers in the performances of Nguyen and Ada, but experiencing the play through their faces also encouraged me to seek parallels with my family’s experiences. The Globe and Mail Theatre Critic, J. Kelly Nestruck, recently wrote glowingly about Factory Artistic Director Nina Lee Aquino’s continual commitment to diversity and, after watching Salt-Water Moon, it’s clear that her hard work pays off. Salt-Water Moon is playing until March 13th, 2016 at Factory Mainspace Theatre (125 Bathurst St.). Shows run Tuesday to Saturday at 8 pm with Sunday matinees at 2 pm. This show is approximately 90 minutes long with no intermission. Ticket are $35 and can be purchased online, by phone at 416.504.9971, or in-person at Factory’s Box Office (125 Bathurst St.). Audience advisory: This performance contains open flames and smoke. Photo of Ania Soul, Kawa Ada, and, Mayko Nguyen by Joseph Michael.